We seem to have been here before. A few times before. 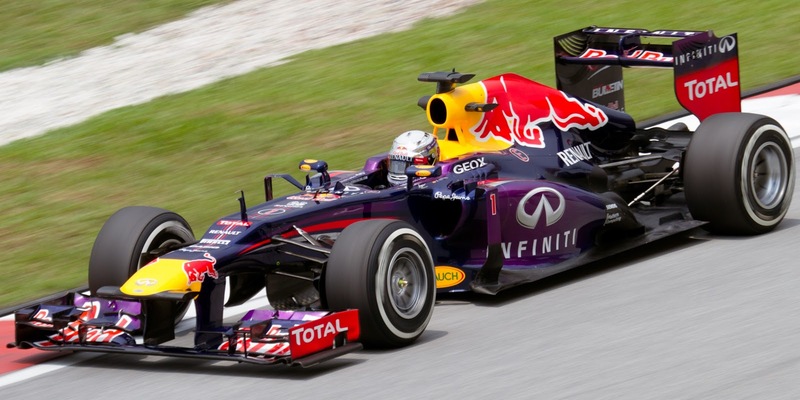 Sebastian Vettel blasts off pole position and has the race in the palm of his hand within a few corners. He's several seconds clear before you know it, and the gap increases exponentially. From then on the race is under his command; he's always able to respond and immediately to whatever threat materialises behind. And he wins of course. Sounds very familiar. We saw it just about every time it seemed in the 2011 season, and on occasion in the 2009, 2010 and 2012 campaigns too. 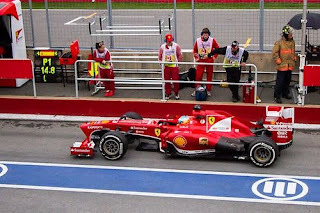 And we saw it today, and at a Montreal track that hadn't always been kind to him or his team. From a few corners in the only race for victory was between Seb and himself, and very strangely that nearly got the better of him. Usually Seb is like a metronome when out front, yet today he glanced a wall at turn four, as well as ran across the grass later at turn one, on each occasion not under particular pressure, and had either punished him more severely then I'd be writing a very different race report. But Seb got away with it, the win was indeed his and he now leads the driver's table by an increasingly beefed-up 36 points. It's way too early of course to herald this as the start of another age of Vettel dominance. The race-by-race form of 2013 has varied, the grid here in Montreal was jumbled a little by rain, and come Silverstone things could look very different once again. But the pace of the Seb/Red Bull combination today will certainly be causing a bit of concern down Maranello and Enstone way. And even if it isn't the start of an imperious run Seb today continued to demonstrate that, whatever the case, he isn't likely to be gifting anything to his rivals this year. He's got the knack currently of maximising his result just about every time. The rain stayed away in today's race, and as expected in such circumstances Fernando Alonso seemed Seb's most credible protagonist. The trouble is that the qualifying rain left him starting in sixth, and while he was in the pack Seb made his escape. Indeed by the time Alonso had made it up to second, by passing Lewis Hamilton's Mercedes, the race was just about over. Alonso will nevertheless view the result as a save, but Seb's pace combined with how hard Alonso had to work just to get to second will be a worry. This in addition to his Monaco experiences suggests that the Ferrari's competitiveness isn't quite as acute as it had been earlier in the season. And, ah yes, Mercedes. You'll have spotted that Lewis finished third, with the silver car able to mix it at the front without its habitual tyre wear impediments. Some will no doubt conclude that this is further evidence of the team having benefitted from its infamous tyre test after the Barcelona race. I wouldn't necessarily say that it's as straightforward as that, particularly as Nico Rosberg had a tough time of it today, sinking back with familiar tyre troubles to finish fifth some 54 seconds after his team mate. So it all suggests that the team at least hasn't solved its long-standing problem completely. And let's not forget too that there were races this season before the test that Mercedes was able to hang on in the race, such as Malaysia and China (and Hamilton did in Bahrain too). And Paul Di Resta once again put in a fine race day run after a frustrating qualifying. He started on medium tyres and was still running on them 57 laps later, when he made his one and only stop, and all the while his lap times were strong. Seventh place was his reward in the end. And Jean-Eric Vergne did one better, finishing sixth in his second points finish in a row, wherein he took advantage of a good starting slot and being able to clear Valtteri Bottas early. But for McLaren though Monaco appears to have been a false dawn: once again Jenson Button and Sergio Perez were midfield fodder and indeed finished out of the points. While after starting third in a dry race Bottas couldn't overcome the FW35's shortcomings and sank down the order rapidly, and was fourteenth by the chequered flag. And as for Kimi Raikkonen? He finished ninth and lapped, having enacted a one stopper which didn't begin to work (and quite why the team didn't abandon the idea is anyone's guess). And the idea has started to swirl that the Lotus has lost a bit of ground on its rivals in terms of pace. But they may have the comfort of not being the only ones. For Sebastian Vettel today it was a lot like old times. Stopping him in his march towards title number four is clearly not going to be a straightforward task. Hi. I thought Mark Webber's race was pretty strong, though as is often the case he never seemed able to match Vettel’s pace, in quali or the race itself. He looked determined and combative throughout though. As for his clash with Giedo van der Garde, you could argue that Webber came from a long way back, and was perhaps putting his car at risk by aiming for the inside as he did, but by the same token van der Garde's line did look a lot like he was moving over to let Webber past. So I'd say the clash was about 15% Webber's fault and 85% van der Garde's. I’m not sure if without it Webber would have finished third, he was 10 seconds behind Lewis at the end and as Alonso found out Lewis wouldn’t have been easy to pass. But then again we don't know how much the damage slowed Webber. As I watch Red Bulls performance from 2009 Onwards - All I can think is - What in the World was Newey doing at McLaren between 2000 and 2005. The cars he designed were no slouches , especially in 2003 and 2005, but nothing like the dominating machines of late '09, 2010 or 2011. What I'd give to've been a fly on the wall in the McLaren Offices back in those days ! Hi Seamus :) It's a very good question regarding Newey and McLaren. It's clear that for whatever reason McLaren generally got much less out of him than Williams did and than Red Bull do. My theory is that McLaren's environment didn't suit Newey all that well. It strikes me McLaren with its matrix structure etc is very big on doing things as a collective, with rigour, evidence etc etc. Whereas Newey much more acts from inspiration. And at Red Bull he's been able to design a technical team from scratch pretty much, and to design it in his own image. I recall too that in the early noughties there was some talk of Newey falling out of love with F1, speculation about him going off to design power boat racers etc, so perhaps that was part of it too.